Every Monday night, The Celtic Arts Center offers workshops in the Irish language (Gaelic). The workshop is held in board room upstairs at The Mayflower Club from 7–8PM. The Beginner Level Workshop is a basic introduction to the Irish language using the text "Progress In Irish" by Mairead NiGhrada (textbook info below). Tuition for this introductory workshop is FREE and open to the public. Enrollment is on-going and everyone's welcome to join at any time. Just show up at 7PM on any Monday night at The Mayflower Club and start learning Irish! 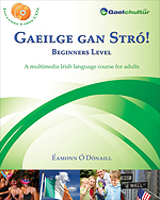 And be sure to eventually get a copy of the textbook and maybe a 'foclóir póca' and bring them to class. Please feel free to come down any time and check out our Monday night language workshops — no pre-registration is necessary. If you have any additional questions about our language workshops, you can e-mail us at language@celticartscenter.com . Additionally the Celtic Arts Center from time to time offers more in-depth courses in Irish Gaelic language, as part of our schedule of classes and workshops. Do you need a reason to learn Gaelic? Watch this video short "Yu Ming is ainm dom." (Real Player required). It is not mandatory that you have the texts with you the first class you attend, but please consider buying them soon after joining the class. Below is a list of other books we use in our workshops and some convenient places where you can find them.  just west of Whitsett, on the south side of the street. "Open to visitors...but call to let 'em know you're coming." You've seen them at fairs and Highland games. You may even have visited the tea room. Publisher of books in Irish and of traditional Irish music. Their website is a great resource for Irish language students and musicians. They have an extensive selection available for purchase online and the ability to search their entire catalogue. A great online resource for purchasing Gaeilge books, magazines, recordings, etc. online. "Every Irish book in print."